1. How we visualize and understand the situation, the conflict, in this moment. 1. Unfortunately only a small part of the population is aware of the problems, even as the entire population suffers from the war.This small portion who are aware are now passing from a stage focused on conditions of living to a focus on national autonomy. What history has shown us is that the Colombian people will not take this on our knees. "We will not allow ourselves to be killed while we are kneeling down." The Central American struggles provided us with inspiration for our struggle. We knew the advances in Central America which inspired us would also move our govt to prevent us from organizing in the same way.Today our fear is about the developing of the war in Colombia. Even as there is great organizing effort, there are also many people willing to go to war and it will destroy many. "But we also have great hope.... We are going to stop this monster imperialism, by organizing from the bottom up.The government will never stop this imperialism; we must stop it." Both pueblos, the US and Colombia, need to relate to each other in real equality. We need to get to a point of seeing each other more clearly and equally. People of the US need to be able to view others as equals with legitimate programs for development. We -- as Christians, farmers, and Colombians -- have done a lot to advance this equality. "We need to globalize solidarity." The campesino movement of Cajibio takes it as a principle that our work will be joint with Witness for Peace. There are so many women who have given their lives for the transformation of this country, for maintaining these ideas which create life. [Marylen, I recall, made a point about women in the campesino movement not considering themselves "feminists" because they understand that concept as separating themselves from the joint struggle. This struck me as a similar sentiment that is expressed by many women of color in the US. Margaret]. Marylen was born in the town of Carrizal, in the municipality of Cajibio in the southwestern state of Cauca. She comes from a very poor campesina family of 5 children, for whom her parents made great sacrifices to provide them with minimal opportunities. Thanks to her parents' efforts, Marylen was able to make it through elementary and high school, and later continue on to university to study Social Sciences with an emphasis in Anthropology in Medellin. Marylen states that the goal of their family life is to "build a common dream and to walk hand in hand everyday on a path towards encountering a dignified life for our people and the future of our two children." In 1986 she began her community work as a teacher in the Agriculture and Forestry Institute, and later went on to take leadership roles with Christian Base Communities, woman's organizations and to work on community development projects. 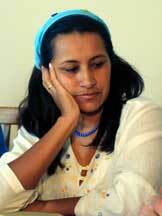 By the early 90's Marylen participated in the founding of the Campesino and People's Movement of Cajibio. This organization is made up of small farmers, catechists, women and others and continues to be one of the most important social organizations in the region. Soon after its founding, the organization and Marylen participated in a national level protest that was repressed by the national police force and 24 people were taken prisoner, including Marylen. In 1999 the organization again participated in a major protest, the Mobilization of the Colombian Southwest. The 12,000 members of the Campesino and People's Movement of Cajibio were part of the 60,000 participants in the protest. Marylen was one of the coordinators of this protest, which called for respect of the social, political, economic and cultural rights of the population of three states. After the end of the protest, Marylen continued to play a leadership role in follow-up with the national government to ensure that it would comply with the agreements it signed to end the protest. 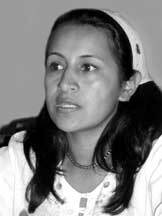 Currently Marylen is part of the leadership of the Campesino and People's Movement of Cajibio and from that position she continues to work with and accompany the rural communities of her native municipality of Cajibio. She explains the role of the organization as the following, "This movement has shown in its 11 years of existence a history of struggle and tenacity and has been slowly but surely growing and gaining momentum over the years to include more sectors from different people and organizations who want to construct a different world. Initially the movement began on a municipal level, but now its work is carried out on a regional, state and national level to strive for justice for Colombians." Today her work with the organization centers in two primary areas. One is the "Plan de Vida", which is the community's project proposal for a sustainable development as an alternative to the destructive Plan Colombia that is called "Plan de Muerte", or "Death Plan" by the organization. The other area of focus is the human rights situation and the effects of the armed conflict in the communities. In the past two years the human rights situation in the area has significantly worsened as the armed actors have stepped up their activity. Since that time at least 23 people have been assassinated in the communities. Marylen and other leaders in the region are currently working with national and international human rights groups to denounce these serious violations. Due to her leadership on this and other issues, at the end of 2001, Marylen and her family were forced to leave Cauca due to persistent death threats. Currently they reside in the capital city of Bogota and Marylen continues her work with the Campesino and People's Movement of Cajibio from there at great personal risk. Marylen is looking forward to her opportunity to participate in a Witness for Peace speaker's tour because, "I want to tell people in the US about how campesino communities are being persecuted more and more each day by the different sides of the conflict. But I also think it's important to also talk about our experiences of resistance, hope, and struggle in the midst of this pain and suffering. I believe that the whole world needs to know what is happening to us, but also all of the good and beautiful things about our communities. ".